Remember to fix your cats between three to five months of age! Help Fix ME is open: There will be vouchers available at the beginning of each month. Call 1-800-367-1317 These vouchers are for cats and pit bulls/pit bull mixes.This is Maine's state-wide low-income spay/neuter program. If your cat is pregnant or in heat please look below for another program as these vouchers can take several weeks to get. Piscataquis, Penobscot, Aroostook, Oxford, Franklin, Kennebec, Lincoln, Washington Counties and the areas reached by The Community Spay/Neuter Clinic (see Topsham about their transport areas). SPECIAL NOTE: If you live in York or Cumberland Counties call the AWS Community Veterinary Clinic at: 207-985-3244 ext. 128 or the Animal Refuge League clinic at: 854-9771 extension 400. AWS/Cleo Fund vouchers are not for York and Cumberland Counties because there are these two very good spay/neuter clinics nearby. Auburn: For dogs and cats (not limited to low-income): Dr. Steve Kinney, Auburn Animal Center 784-2000. Cat neuter $65, spay $125-135. Dog price depends on weight so please call the clinic for details. Prices are very reasonable. Augusta: East Coast Shelter Clinic. Low cost spay/neuter for dogs and cats. Dog spay or neuter $150-200. Cat spay or neuter $75. Call for appointments and details: 626-2893. Some other services in addition to spay/neuter available. Clinic does not take vouchers. Bangor: Bangor Humane Society has assistance for both cats and dogs. Low income. Call 942-8902 for details. Bar Harbor: See Trenton below. Brunswick: Cats only. Cats are FREE. For low-income residents of Coastal Humane Society's contract towns: Bowdoin, Bowdoinham, Brunswick, Cumberland, Durham, Falmouth, Freeport, Harpswell, Lisbon, Phippsburg, Pownal, Sabattus, Topsham, Woolwich, Yarmouth. Will receive a certificate to use at the Community Spay-Neuter Clinic. For info, call the shelter at: 725-5051 ask for Darlene. Caribou: North Country Animal Hospital has spay/neuter clinic prices! Cat neuter $65; cat spay $110. These are regular prices so no vouchers needed and no vouchers accepted. Call 492-4651.
ext. 120 or the Animal Refuge League clinic at: 854-9771 extension 400. Assistance available when the shelter has grants. Farmington/Franklin County area and other areas: Maine Woods Mobile Vet: 491-5501. Low-income low cost spay/neuter clinics for cats and male dogs. Will do feral cat colonies and pediatric spay/neuter (8 weeks old). Individuals call for locations of clinics. Shelters and rescues call to schedule clinics. Will do clinics in the northern counties. Ft. Kent, Frenchville, Madawaska, Eagle Lake, Wallagrass, St. John, St. Agatha, St. Francis, Soldier Pond, New Canada, Cross Lake, Allagash. Freeport: Community Spay Neuter Clinic has moved to 321 Lewiston Road, Topsham. Call 721-8395. Very easy to get to from Route 295. 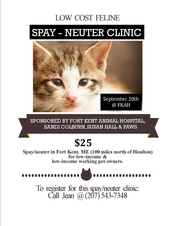 Fryeburg: Low-income cat spay/neuter clinic once per month. Call the Harvest Hills Animal Shelter at 935-4358. Lewiston-Auburn Area: Greater Androscoggin Humane Society: 783-2311. Cats, male or female FREE, pit bulls and pit bull mixes $10. Includes rabies vaccine. Year round: Mother cat and dog programs and other assistance. Call the shelter for details. Mount Desert Island: See Trenton below. Norway: Well Point Veterinary Service: low cost cat spaying and neutering (cats only) on the first Wed. of every month. No income requirements. Call: 743-6441. 86 Roberts Rd. in Norway. Female cats: $60, $66 if pregnant or in heat. Males $40. A current rabies vaccine is not required but can be purchased at an additional charge of $15. Cats: $60 female, $70 if pregnant. $30 male. Dogs: neuters only--prices range from $120-$150 depending on weight. Dog spays not available. No additional fees required for spay/neuter surgery but other services are available. Portland area: See Westbrook below, Animal Refuge League. available. A current rabies vaccine is not required but can be purchased at an additional charge of $6.Portland area: See Westbrook below, Animal Refuge League. Rockland/Thomaston area: Vouchers available from the Pope Memorial Humane Society of Knox County for the towns the shelter serves. Cats and dogs. Call for details: 594-2200. South Paris: Call 743-8679, Responsible Pet Care, for spay/neuter assistance. Also, if you qualify for Help Fix ME (see above) they can help you with the paperwork and help pay the copays. South Portland: Cats and dogs--no income requirements. Cat spays and neuters: $60. Includes pediatric (8 weeks old), pregnant and feral spay/neuter. Dog spays and neuters-- must be equal to or less than 4 months of age: males: $85, females $120. Call So. Portland Veterinary Hospital at 767-7784. Trenton: The SPCA of Hancock County has low-income assistance for cats and dogs. Call the SPCA PAL Program: 667-8088. Topsham: Low cost dog and cat spays and neuters at the Humane Alliance model Community Spay/Neuter Clinic in Topsham. 721-8395. Transport areas: Augusta and Waterville. Waterville: Local clinics or free transports to and from Community Spay/Neuter Clinic regularly. Call 721-8395. Without vouchers cats only $60, call for dog prices. This clinic accepts several kinds of vouchers, ask for details. Westbrook: Clinic at the Animal Refuge League. Call 854-9771 ext 400. Cats: $60. Feral cats free. Dogs, price according to weight. Call for more information and to make an appointment. Additional services available. West Kennebunk: Animal Welfare Society: AWS Community Veterinary Clinic. No income requirements. Cats/kittens from anywhere $60. Feral cats free. Rabies vaccine additional $10. Dogs: any size accepted, call for price according to weight. Other services also available. Call: 985-3244 ext. 128. York County: See West Kennebunk. Lots of programs at The Animal Welfare Society. 1) Feral cats: State-wide: If you are an individual feeding feral cats and you qualify for Help Fix ME (1-800-367-1317), remember Help Fix ME vouchers can be used for feral cats. Not all vets operate on feral cats so be sure to check with your vet to make sure he/she accepts Help Fix ME vouchers and will do feral cats. The Help Fix ME program is not for organizations or rescues--just for individuals. 2) Feral cats: Free feral cat spay/neuters through the AWS Community Veterinary Clinic's Trap-Neuter-Return program in West Kennebunk: call 985-3244 ext 120. 4) Feral cats: Call The AWS/Cleo Fund.. 773-6221. No income requirements for feral cats. See top of page link under AWS/Cleo Fund if you would like to apply for vouchers online. We wish to thank all the compassionate veterinarians who participate in Help Fix ME and The Cleo Fund. You do a great public service. Thank you! Remember the spay/neuter tax check off. 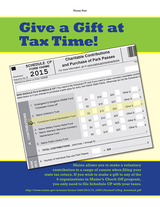 Check the box on Help Fix ME's state of Maine tax check off! See Maine Schedule CP--The Companion Animal Sterilization Fund. Get your new Animal Welfare "Adopt" license plate. It is colorful and will really dress up your car! Plus it funds Help Fix ME. Prevent accidental litters! Spay or neuter your pets before they are five months old.